We demonstrate real-time tracking of the 3-D pose and configuration of the hand for gestural user-input and desktop virtual reality. 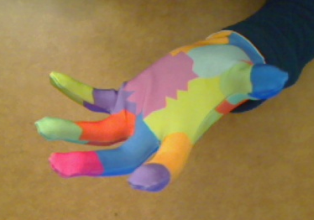 The only components of our system are a cloth glove and a webcam. Our system is low latency (~100 ms) and can track the relatively fast motion of this sequence. Our system can be used as an input device for desktop virtual reality. Here we demonstrate rotation and scaling of the Stanford bunny with both hands. Here we demonstrate controlling a (crude) flight simulator by manipulating a virtual yoke. 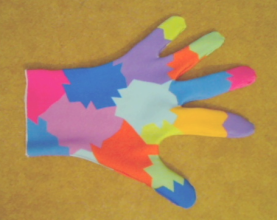 The color glove is printed on a Lycra fabric and does not contain any obstructive sensors. The pattern is designed to be distinctive and facilitate robust tracking. We're starting a company, 3Gear Systems, based in part on this technology.